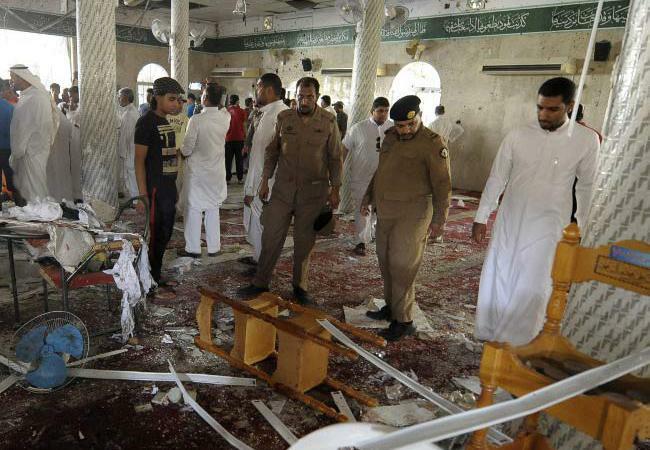 JNN 08 Aug 2015 RIYADH: A blast probably triggered by a suicide bomber killed 15 people on Thursday at a mosque inside a special forces headquarters in Saudi Arabia near the border with Yemen. An interior ministry spokesman said the terrorist attack took place during noon prayers in the city of Abha, in the southern province of Asir. Twelve of those killed were members of a Special Weapons and Tactics (SWAT) unit, while the other three were workers at the compound, officials said. Seven people were also wounded. The self-styled Islamic State (IS) has claimed responsibility for the attack. Thursday’s bombing was the deadliest in a series in recent weeks against Saudi security forces, who have been targeted in attacks blamed on IS. “The terrorist attack struck worshippers during prayer,” the spokesman said, giving an initial toll of 10 policemen and three workers killed and nine people wounded. Al-Akhbariya state television later said that two policemen wounded in the “heinous” attack had died, bringing the death toll to 15. The interior ministry spokesman said the attack was likely carried out by a suicide bomber, saying that “body parts found at the scene” indicated the use of explosive vests. The governor of Asir province, Prince Faisal bin Khaled bin Abdel Aziz, visited the site of the attack and the wounded in hospital, condemning the bombing. “The attack is aimed at destabilising the country and sowing fear among citizens,” he said, according to the official Saudi Press agency (SPA). An interior ministry spokesman told AFP it was too early to say who may have carried out the attack. On July 16 a car bomb exploded at a security checkpoint near a prison in the capital Riyadh. It killed the driver and wounded two policemen. Officials identified the driver as a 19-year-old Saudi man and said he had killed his uncle, a colonel, before blowing himself up on a road near Al-Hair prison, a high security facility. IS claimed responsibility for that attack, saying it was a message to jihadists held at Al-Hair that they had not been forgotten. Two days later, Saudi Arabia said it had broken up an IS-linked network and arrested more than 430 suspects involved in attacks and plots, including suicide bombings of Shiite mosques. The interior minister said the suspects had plotted attacks on an unidentified diplomatic mission and mosques, including one used by security forces in Riyadh. In the southwestern Saudi city of Taif on July 3, a policeman was gunned down during a raid in which three people were arrested and flags of the IS group found. An IS-affiliated group claimed responsibility for suicide bombings on successive Fridays in May at mosques of the minority Shia community in an eastern province that killed a total of 25 people. The group calling itself Najd Province also claimed a suicide bombing that killed 26 people at a Shia mosque in Kuwait in June. Saudi Arabia and its Wahabi Gulf neighbours last year joined a US-led military coalition bombing IS in Syria, raising concerns about possible retaliation in the kingdom. The Wahabi-ruled kingdom also leads a coalition that has launched air strikes since March against Shia rebels who have overrun much of neighbouring Yemen and forced the government into exile. Al-Qaeda waged a campaign of shootings and bombings against foreigners and Saudi security personnel between 2003 and 2007. Earlier the death toll was reported as 17 dead, which has since been revised by official sources. This entry was posted in Middle East and tagged interior ministry spokesman, ISIS, Islamic State, ministry spokesman, Mosque, Saudi Arabia, Saudi security forces, security forces, Secutity forces, Suicide attack, Suicide Bomber, the terrorist attack. Bookmark the permalink.